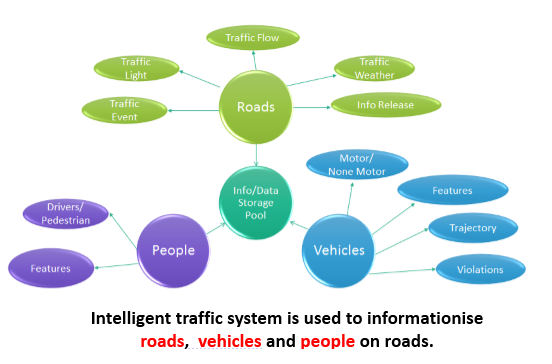 Intelligent traffic system is used to informationise roads, vehicles and people on roads. The main targeted user is traffic police. They want to know roads: traffic events, traffic light status, traffic flow status, and traffic weather on roads. They also want to release necessary information to guide drivers. They want to know vehicles: weather it is a motor or non motor，features like license number， body length， color, brand etc. trajectory in a past time period, and violations. They want to know people: weather it is a driver or a pedestrian, features like gender, age. All Information and data will be stored in center. Traffic police can monitor traffic status in real time, search useful information from past time and get reports from past data. Intelligently assist solve criminal cases. This is ITS System Topology. It is a classic IOT (Internet of Things) system. 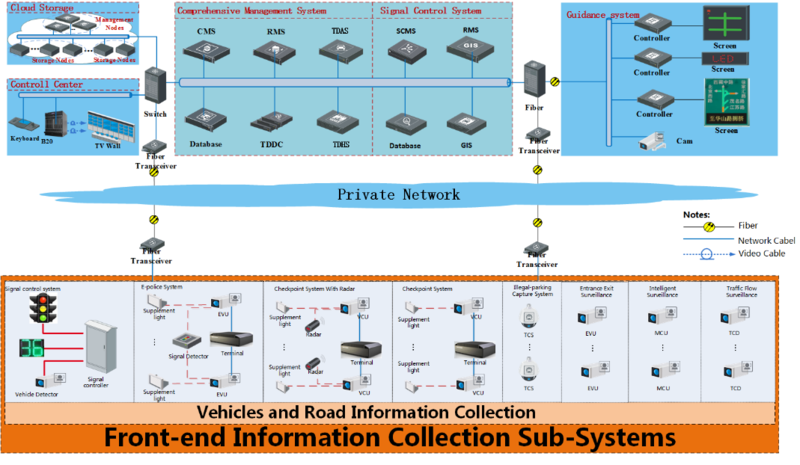 It consist of front-end sensing system, transmission system, central device management system, central information data storage system, applications for businesses. In front-end systems, there are signal control system, e-police system, checkpoint system, checkpoint with radar system, violations surveillance, traffic flow surveillance, intelligent surveillance. In back-end software, there comprehensive management system and signal control system. The Cloud storage is a latest technology. It provides a huge, safe and extensive storage pool. The Guidance system is to release information to guide drivers. Let us go into products.